Well if your on a budget, there are lots of bargain based bubblies to be had. Look to Italian Proseccos or Spanish Cavas. Proseccos tend to be dry crisp, lightly carbonated in in my humble opinion are very food friendly. This one is pale in color with a nice crisp nose. On the mid pallet the wine is crisp and dry, with some minerality. The bubbles are nice and light as is common with Proseccos. The wine is on the lighter side of medium in length on the finish leaving behind some mild citrus notes. The LCBO describe the style of this wine as light a fruity, and I would agree. 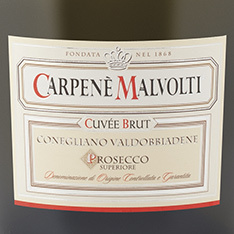 This is definitely not an oustanding Prosecco, but not a bad one either. I would give it an 88 or so. For my money I would go with the last prosecco I rated Bottega over this one for similar money. As it is, I took the Bottega over to my family Christmas and before I knew it, it was all gone!